with our Kirra Backstrap Sandal. This is my third pair of Kira. I have it in white and camel. So comfortable! I wanted some comfortable sandals and loved how these looked on the website but they are much "clunkier" in person than they looked. They are super cute, comfortable and supportive but they were very loose and wide. I usually wear a 7 1/2 or 8 and have a very high arch. I bought the 7 1/2 but they were just too big. Too bad, they are very nice looking and comfy. I never thought I'd be able to wear a sandal like this again. 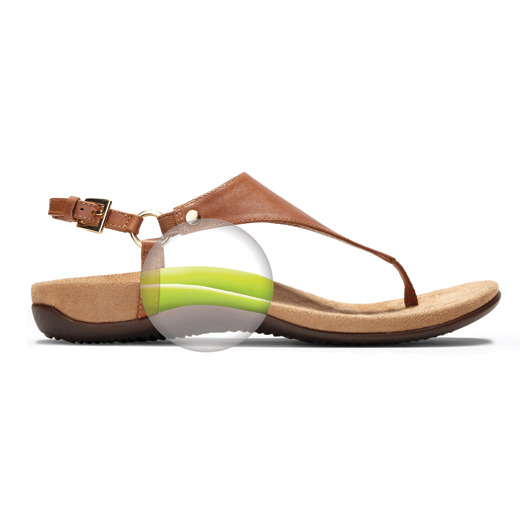 But with the Vionic arch support in this sandal, I am able to! The straps could be a little bit tighter...it does feel a little bit loose. But - the sole of the shoe stays stable underneath my foot. And my toes are free in the warm weather! The only problem is trying to get the strap through the opening that holds the strap! I have been buying Vionic sandals for years for their arch supports and for their style. However, I wish Vionic would change how the upper attaches into the sole in the toe area on their T-strap sandals. They use a ribbon to secure the upper into the sole, making the sandal loose on the foot. Adjusting the buckle makes it more snug around the ankle, but the shoe still tends to "flop" somewhat. Very annoying! Please fix, Vionic! !